Let the chips fly!! 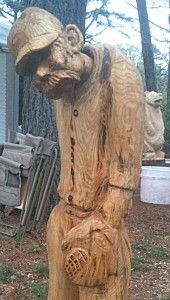 Last weekend we attended Carving in the Ozarks here in Eureka Springs, AR. 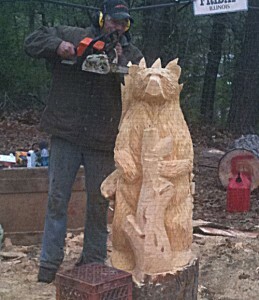 Each carver spent two days of furious cutting with super sharp chainsaws, some of them with very pointy ends. Were they actually carving, or practicing for a slasher movie? When we arrived it appeared they had contained the carvers in their own cages. We were told, no, that’s a net around their area to keep the chips from piercing the observers. Maybe, but we felt safer with them behind what we continued to imagine as steel mesh. Late Saturday we went back to attend the auction, hoping to buy one of the creations for our bed and breakfast inn. We didn’t get what we wanted, but if you are in the market for some good prices on benches, bears, figures or whatever else they make out of wood, you need to attend this event next year. Here’s a couple of other pictures of the show. It was just fun watching the carvers deftly use their chainsaws. Hope you get a chance to see them one day.